Are you looking to add an extra sparkle to your wedding day? If you are hoping your guests will get up to dance and enjoy the happiest day of your life by your side, take a look at hiring an LED dance floor for the occasion. Weddings take a lot of time and effort to organize so take some of the stress away by letting us handle the dance floor. There’s no doubt that the dance floor is an essential part of the party and dance floor hire with Fun4Hire makes it even easier to guarantee a great dance will be had by all. What is an LED dancefloor? Perfect for weddings and events, an LED dancefloor is a fun and easy to fit portable dancefloor that twinkles with star lights. It creates a romantic atmosphere and the perfect area for dancing, no matter what the size of the venue. These dancefloors are low maintenance, quick and easy to install and look divine. They add a modern, stylish and inviting twist that people absolutely love. Why choose LED dancefloor hire? Hiring a dance floor is an affordable way to ensure your special day has a clean, appealing and eye-catching space for your first dance and for your guests to enjoy. The first dance is such a special and intimate moment, why not use the romance of stars underfoot to bring even more magic? This dance floor gives a beautiful effect for you wedding photos and can be enjoyed day and night. Dance floor rental is incredibly popular as it is easy, stress free and completely customizable. You choose what you like and what best suits your occasion and Fun4Hire will deliver it to you, it’s as simple as that. Dancefloor rental easily transforms any space into a sleek, stylish and wedding-ready venue. It’s become one of the latest wedding trends for a reason and all you have to do is glance at photos of a wedding with an LED dance floor to see why so many brides are over the moon dancing amongst the stars. The versatility of the LED dance floor hire is incredible, the dance floor is made up of tiles which are secured together meaning you could use them to create a gorgeous walkway or dance floor. You can create the perfect dance floor to suit any space. 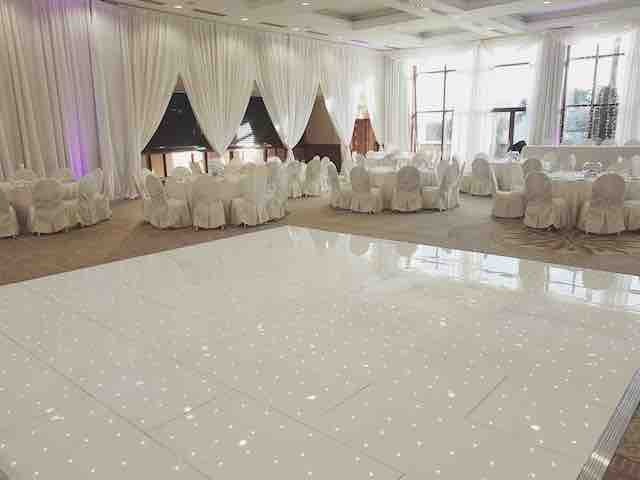 The tiles lock into place, are durable and very easy to clean so no shoes or spillages will damage the dance floor. Creates a fun environment where the dance floor becomes a centrepiece and encourages the party. Perfect for photographs – the effect the LED dance floor brings to wedding photographs is stunning. Couple even decide to place the wedding cake in the centre of the dance floor purely for the gorgeous photo opportunity the dance floor creates. Of course, these dance floors are ideal for any event. If you’d like more information or you’d like to book LED dance floor hire for you wedding simply contact Fun4Hire today on 07903 973 963 or via their website www.fun4hire.net. The team are more than happy to discuss the dance floor options with you and can deliver items across Yorkshire and beyond.